The Age of Glass is a group exhibition showcasing a curated selection of recent and new art and design works created by more than 25 creatives around the theme of contemporary glass and highlighting the renewal of contemporary glass art and design practices that are all Made in Meisenthal, France. The Meisenthal glassworks was founded in 1704 in the massif des Vosges du Nord, in eastern France. The factory, which counted 650 staff, closed its doors in 1969. In 1992, the International Glass Art Centre (Le Centre International d’Art Verrier, or CIAV,) of Meisenthal restarted the first kiln on the brownfield site. 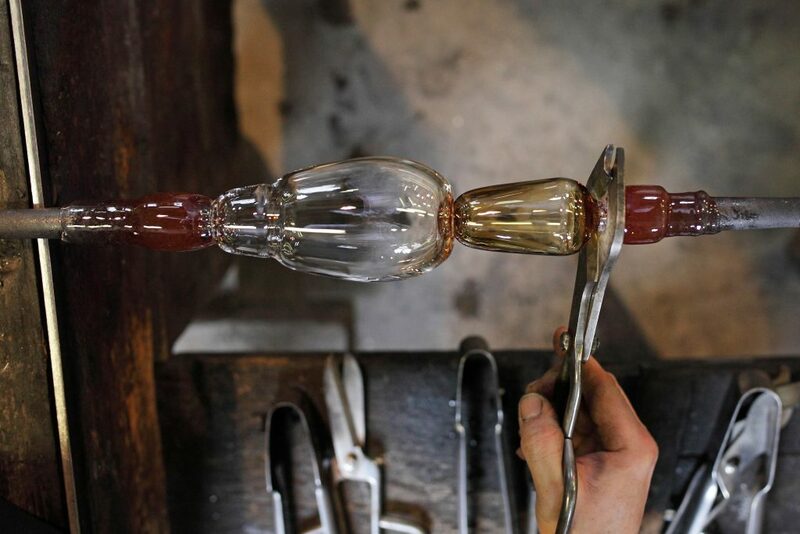 CIAV’s objective was to preserve the technical heritage of the region and to reinstate the traditional glassworks production by welcoming contemporary designers into the workshops. On one side is the glassworker, his hands, his knowledge of the traditional technical alphabet, his self-assurance. On the other is the designer, his universe, his questionings. And between the two, the desire to write, together, new stories of the objects. For the designers, beyond the glass itself is the entire village of Meisenthal, which becomes building material. The residents, the brownfield land, the ghosts of its workers, its morning mist, the majestic forest… in other words, the spirit of the sites, which generates a unique, endemic energy that is reflected in the objects that are born there … CIAV edits, under the « Meisenthal-France » brand, small series of glass objects that fulfil the mechanics of the crossover between traditional multi-secular technique and the dreams of the contemporary creators. The pieces presented in the exhibit were conceived by artists or designers. They are the produced in either open or limited series or may be unique pieces or prototypes. Featured artists and designers: Werner Aisslinger, François Azambourg, Ferreol Babin, Berger & Berger, BL 119, Andreas Brandolini, Mark Braun, François Daireaux, David Dubois, Fabrice Domercq, Christelle Familiari, Grim Design, Stéphane Halmaï -Voisard, David Hanauer, Sabine Marcelis, Régis Mayot, Jasper Morrison, Françoise Petrovitch, Fred Rieffel, Berta Riera Pomes, Studio Monsieur, Claude Saos, Borek Sipek, V8 Designers, Tibor Weissmahr. – During Design September: Horta Museum, Brussels, BE, with Marcin Rusak solo exhibition.